The latest addition to our Sherwood family takes inspiration from classic gallery white tones. Sherwood French White is a timeless design in a refreshed, chalk-like hue which looks stunning against knotted woodgrains and herringbone flooring. Our Richmond Family embraces innovative technology in the development to produce a stylish slab door. Richmond Grey Oak draws on the continuation of the rise of grey with a grey-toned oak. Richmond Pebble Grey introduces a warmer grey tone in the on-trend matt finish. Eton Matt White extends the Eton Family with a new colourway in our matt foil technology. The fingerprint resistant surface creates a practical yet stylish kitchen in a cool white tone. Our new True Handleless kitchen designs captures the current trend for uninterrupted lines, minimalist styling, and a clean uncluttered look. 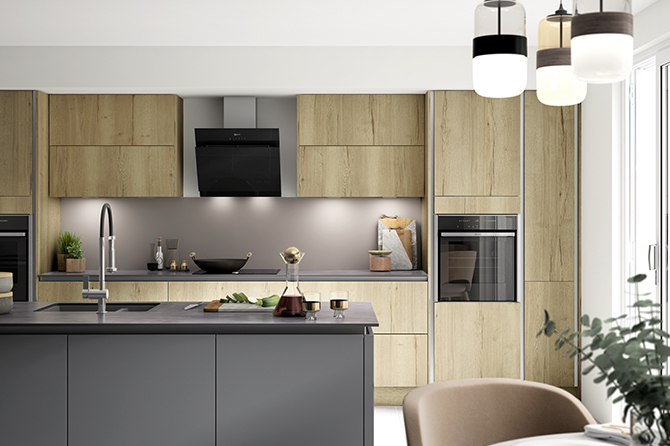 Enhance the look by mixing and matching fascias, why not mix some Eton Matt Carbon feature units with Eton Oak to tap into the hottest design trends. For your reassurance, all our cabinets and soft close drawer boxes come with lifetime guarantees and all our fascias are guaranteed for 5 years.